Building a successful career in the corporate environment requires savvy, positive attitude, and mastery of certain practices that are rarely disclosed. 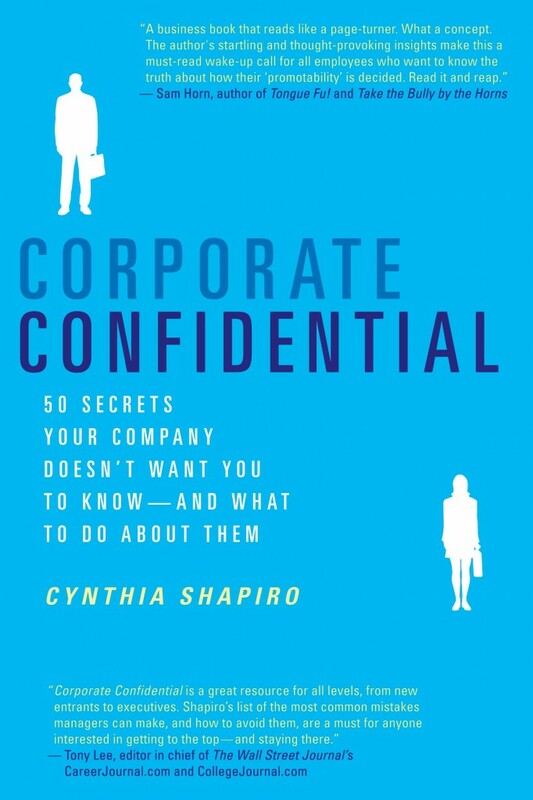 In her excellent 2005 book, “Corporate Confidential: 50 Secrets Your Company Doesn’t Want You to Know—and What to Do About Them, “Cynthia Shapiro shares fifty secrets for corporate career success. I found the book helpful and highly thought provoking. Some of her suggestions conflict with conventional wisdom and that makes the book all the more worth your time. Note that the book is likely to apply to environments beyond the Fortune 500. If you happen to work in government or a medium size company, there is still much great material. The book starts by outlining typical mistakes and mistaken beliefs that cause failure. It may sound negative to start with mistakes. Yet, Shapiro makes a great case that these mistaken habits will prompt management to question your judgement and discount your positive contributions. Shapiro lays out a number of critical mistakes and problematic beliefs that hold employees back from achieving success. As a former HR executive, Shapiro reminds us that the HR unit serves the company’s interests above all. That means complaining about management to HR and other negative comments are not private and are likely to be shared with others in the organization. Other career landmines include misuse of expense accounts (Shapiro’s comment: “Every time you submit an expense report, you’re putting your true loyalties in writing for all to see. Are you thrifty or extravagant when on the company’s dime?`) and poor dress choices. These are basic concepts that matter to getting ahead. In a few short pages, Shapiro delivered outstanding and timeless value to readers. These capabilities apply to all careers and become absolutely vital at higher levels. Sales. Over the past few years, there has been a growing recognition of the value of sales skills (e.g. `To Sell Is Human`by Dan Pink) for the entire workforce. In IT and projects, sales skills matter because project managers need to develop and “sell” their ideas to clients and managers. In career management, professionals are obliged to sell their services in order to win job opportunities and choice assignments. Fortunately, there are many great resources available on sales. Sales Resource: A few popular authors on sales skills include: Brian Tracy (I`ve used his material and he also comes recommended by Shapiro), Jeffrey Gitomer, and Zig Ziglar. Public Speaking. At first glance, public speaking skills may not seem relevant to many readers. After all, they do not plan to campaign for votes, address a public meeting or present to an executive. In fact, public speaking skills improve your effectiveness in many different scenarios. Advocating for increased budget, presenting yourself in a job interview and inspiring a new project team during a kickoff meeting are all circumstances where public speaking skills come to play. Of course, professionals seeking a promotion to management are called on to present and speak with regularity. If that is your goal, then it makes sense to get started developing this skill early. Public Speaking Resource: Toastmasters remains an affordable and friendly way to develop your public speaking skills (see the article I wrote last year: How To Become Successful With Toastmasters). In fact, the organization also provides optional programs on sales presentations and interactions so you can develop both speaking and sales skills. High-level goal achievement. Over the past few years, I have been focused on learning the art of goal setting and achievement. There are several aspects to the skill including designing goals with the right level of challenge and using tracking systems. The step by step process Shapiro presents, adapted from Brian Tracy, is great because it emphasizes developing additional options and solutions – there are often multiple ways to achieve a goal. The ability to develop goals and then devise multiple ways to achieve success is important in a corporate environment where new challenges often emerge to block your success. 1. Write down your five biggest goals for the year. 2. Pick the one that will make the biggest difference in your life. Tackle that one first. 3. Write your chosen goal in the past tense as though it’s already happened. This will not only tell you whether you truly want it by how you feel as you look back at it from the future, it will also help you identify (in imagined hindsight) all the critical steps it will take to get there. Outline as many critical steps as come to mind. 4. Write out twenty different things you could do right now to make it happen. Really stretch your thinking in new directions to get all twenty. Now pick the one that will have the greatest impact on the achievement of that goal. Your attitude and actions toward your manager make a tremendous impact to your career success. In the best case scenario, a manager`s recommendation opens doors, provides resources and advice to help you grow further. In the worst case scenario, a lack of manager support weakens an individual’s promotion prospects. Building an effective relationship with your manager requires both a positive attitude and several actions. Shapiro`s recommendations include volunteering to grow yourself (though not at the expense of your current tasks) and seeking to understand the manager`s preferences. Learning preferences can take a while, so start with the basics: do they prefer to read or listen? This important communication style topic is covered in greater detail in a Manager Tools podcast: Is Your Boss a Reader or a Listener?. Overall, I found this book excellent and well worth reading. Even better, the book reads easily. The “secrets” structure of the book makes it easy to pick up and put down as your schedule requires. However, if you are frustrated with the system or keen to get ahead, you will probably read it quickly like I did.